All commercial flights other than those going to and from Moscow were canceled at Crimea's Simferopol Airport on Tuesday as the Ukrainian region geared up for a referendum to become part of Russia. One Ukrainian Airlines plane was forced to turn around en route to Simferopol from Kiev, according to passengers interviewed by Reuters and data from the tracking website Flight Radar 24. Before the disruption, one Ukrainian Airlines flight was able to land in the morning. But by the afternoon the airport's online departure board showed that all departures and arrivals -- other than those going to and from the Russian capital -- had been canceled. This was confirmed by several journalists tweeting on the ground. The plane that was forced to turn around contained a Lithuanian representative from the Organization for Security and Cooperation in Europe (OSCE) and a group of journalists. Outrageous: the plane w media &LT #OSCE amb coming from Kyiv to #Crimea was ordered to turn around just before landing...so busy hiding? Crimea is largely Russian-speaking, and last month's regime change in Kiev has been met with fierce protest by demonstrators and pro-Moscow forces. 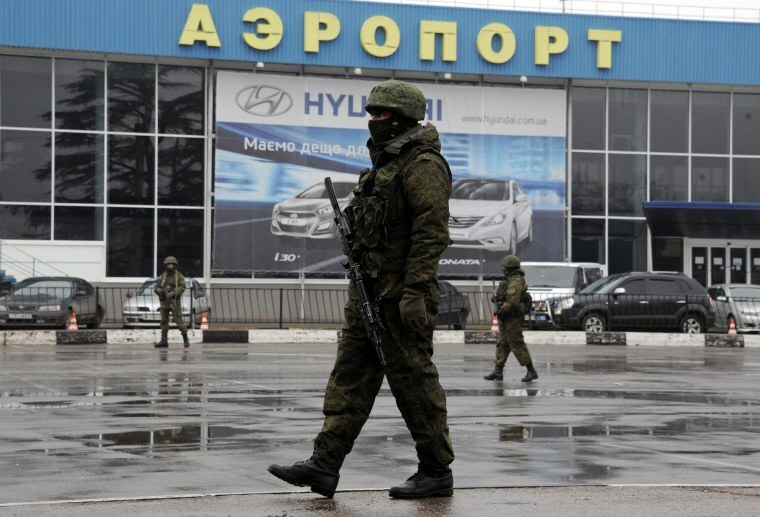 Simferopol was one of two airports seized by pro-Russian troops in unmarked uniforms on Feb. 28. On Tuesday the Russian flag was hoisted above the control tower and Sky News reporter Tom Rayner tweeted these "self defense" militia were "all over" the airport with "knives & batons. Cossack hats & red armbands."